While it may be significantly less than the beastly H5D-60, the Hasselblad H6D-50C is still a very, very expensive camera. The price tag is likely to give many photographers a heart attack, and it’s unlikely that anyone other than pros will ever buy one. It’s also medium format, which is sort of the pinnacle of the pro photographer’s career – one that not everyone needs or wants, but that feels necessary for many at some point. Having said all that, the Hasselblad H5D-60 is designed for professional photographers, and it is an excellent medium format camera. It’s for daily professional use when the highest quality output matters. It’s a tough, versatile DSLR that produces incredibly detailed images. The design of the H5D-60 is very different than most DSLR cameras. However, photographers find that it is comfortable to hold for long stretches of time. The physical controls on the body make sense in location and control – situated in positions for each of your fingers to easily adjust settings. As you would expect at this price point, the picture quality is phenomenal. The camera is also very responsive and fast. 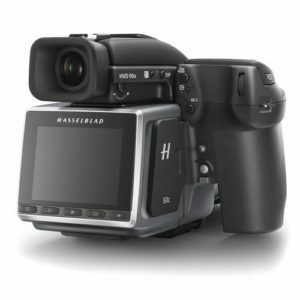 It shoots Full HD 1080p video at 30 fps, which can be saved in Hasselblad RAW format for easy conversion and editing, in H.264 compressed format for even more flexibility. It does not have 4K video capabilities, however, so if you want that you’ll need to spring for the 100MP sensor. Built-in Wi-Fi feels like a necessity for a pro camera of this magnitude, so it’s a good thing Hasselblad included it here. They also worked on power consumption, ensuring that it better utilizes battery life than older models. Every feature you would expect from a professional medium format DSLR, and everything you would expect from Hasselblad is here. What this boils down to is this: there is nothing to regret if you pick up the H5D-60. For full-time pros who need the best possible quality and versatility, the H5D-60 is the camera for you. The Hasselblad name has something of a cult following, and this is due in large part to their attention to detail and consistent quality. If you can get over the price tag (it is probably tax deductible! ), you’ll have yourself a professional medium format camera that will shoot the ultra high-quality stills and video you need it.